Matt and Shelby held their wedding here in Lewisburg on April 18, 2015. It was a sunny, clear day and New Hope Lutheran Brethren Church was bustling with excitement. There were close to one hundred guests who came in from PA, Ohio, and other states to celebrate. 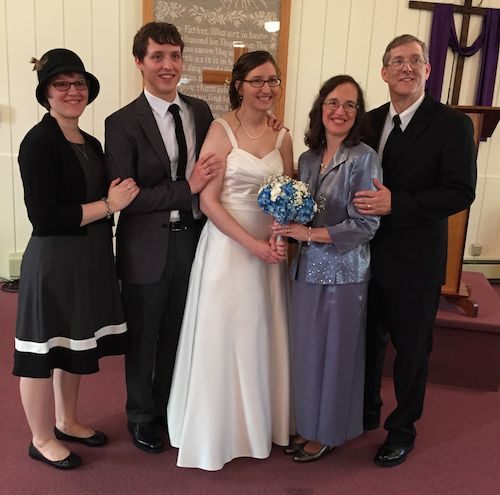 Matt and Shelby had one best man and one matron of honor and Dad performed the service. It was a beautiful and simple service surrounded by lots of love and smiles. The couple celebrated by ringing the church bell and we all cheered! The reception was held at Townside Too in Northumberland. We ate strawberry soup, pork, salmon, squash ravioli, and ice cream pie for dessert. There was dancing and we also had wine from PA and OH. My Aunt took lots of good photos and we were delighted that so many friends and family could come, especially Pap and Gram who have been through some very scary times during this past year.